“Everyone was screaming, cursing, you name it. 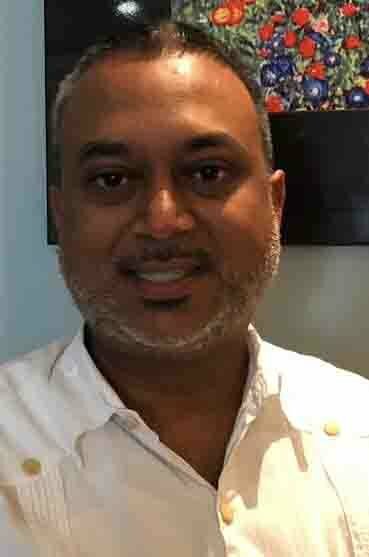 They were calling God and I don’t know who else they were calling on, it was just crazy,” passenger Invor Bedessee, who was set to return home to Canada, recalled yesterday after the crash landing of his Fly Jamaica flight at the Cheddi Jagan International Airport (CJIA) Timehri hours earlier. The flight, OJ 256, which was bound for Toronto, Canada, experienced “hydraulic issues” while still in Guyana’s airspace. As a result, the captain decided to turn around and land back at CJIA but the plane careened off of the runway. Bedessee told Stabroek News in an interview that the flight was initially delayed for over 45 minutes after the plane encountered an issue with one of its doors. A photo of the plane taken by Invor Bedessee after the crash landing. It shows smoke emanating from the left side of the plane, while damage to the right side of the engine and the wing can also be seen. “They couldn’t close it and so after five minutes they called in maintenance and spent about 40 minutes to fix the problem. They took that part out, changed this part out, while everyone was sitting, waiting. After about 45 minutes, they finally got the door fixed and that’s how we got delayed,” Bedessee recalled. After being delayed, he said the flight left around 2.10 am and what he was expecting to be a smooth flight home, after a “smooth take off” did not occur. Instead, he had what he called his “first near death experience,” which left him traumatised. “It [take off] was smooth but after 10 minutes, and I can still see Georgetown and that we’re going up, around 2.25 [am] or so, I saw the plane was circling around and I asked myself what is going on,” Bedessee recounted. He said that at that point he knew there was something significantly wrong because of the way the plane was flying. Not long after, the captain announced that they have “some hydraulic issues” and would have to turn back and land at CJIA. “So we turned back now and we are going back down and the reverse thrusters start kicking in and we hit the ground but the tyre brake was not locking or stopping and when we hit the ground it just kept on rolling towards the end of the runway,” he recalled. While most of the passengers were asleep prior to landing, Bedessee said that all of them woke up after the plane touched down and when it did not stop the commotion started. “Once they hit the bump where the spikes are at the end of the runway and the tyres were blown out, the plane swerved to the right and I noticed the right wing was flapping and it broke off and the engine flipped over on it. Everyone was screaming, cursing, you name it. They were calling God and I don’t know who else they were calling but it was just crazy. I just wanted to get off the plane you know,” Bedessee explained. After the plane crashed into the fence and came to an abrupt stop, Bedessee said that the pilot announced that they should evacuate and without a second thought, as soon as the door opened, he said he ran for his life. “I popped out and took off. I left everything and I ran as far as I can and when I looked back the plane was right at the edge and the nose was off the right. I ran and I ran as far as I can along with like 13 other people,” the man recalled, still visibly traumatised. Shortly after he made it to safety and the plane was evacuated of most of the passengers, he said smoke started emanating from it and this was quickly addressed by the Guyana Fire Service. Despite his ordeal occurring several hours before he spoke with Stabroek News, Bedessee said he was still traumatised and it was his first near death experience. “I’m still shaking, I’m still nervous. I still get goose bumps going on and it’s my first near death experience. My father passed away last year and I guess he’s watching over us and probably said he’s not ready to see me. I’m just taking deeps breaths. I didn’t sleep all night and I don’t think I can at all,” he said. Bedessee, who is a vice president of Bedessee Imports Limited in Canada, said he also left his carry-on luggage, which was either lost or stolen. The bag contained over US$1,000, an iPhone 6, chargers, a battery pack, earbuds and other valuable items. Other passengers and crew members have also complained about missing items from their carry-on and after the plane was evacuated. The Guyana Police Force has since confirmed that it is investigating a report of alleged larceny and that several firemen from the Guyana Fire Service are assisting with the investigation. After the plane was evacuated, the passengers were taken to the terminal, and at that point, Bedessee recalled, everyone was confused and did not understand what exactly was going on. About an hour later, they were taken to the check in section where Fly Jamaica staff were taking their contact details. In terms of communication from the staff to the passengers, Bedessee explained that he was disappointed since “they didn’t know how to cope I guess or handle the situation.” He said he and other passengers were hardly given any relevant information on what happened and what their next step was. It wasn’t until hours after the incident that they were told that they could leave and the airline would make contact with them whenever they have information. “The communication was not the best because nobody knew anything. They kept saying to wait for management and didn’t give us any kind of notice to go get a taxi or to go to a hotel. We were just stranded there for more than an hour,” he said. Minister within the Ministry of Public Infrastructure Annette Ferguson said that passengers were all taken to a holding facility at the CJIA, the operator took all their information and made provisions for them to be transported to their respective homes or hotels. She also noted that some of the passengers would be accommodated on Caribbean Airlines (CAL) flights as soon as arrangements were finalised. Flights are expected to start today. Among the passengers who suffered injuries was Daveanand Sukhram, who related that he suffered minor injuries to his neck, hands, shoulders and feet after being hit with a door that fell from an overhead compartment, and he was squeezed while trying to exit the plane. He also noted that they had to walk more than a mile to reach the terminal. The injured also included 58-year-old Janice Adams and 68-year-old Bebi Ali, who suffered minor injuries to their feet and neck. According to a report on the Canadian Broadcasting Cor-poration (CBC) website, Rabina Roopnarine got a call from her mother, Bebe Ali, who was among those on the plane. Ali, a resident of Toronto, flew to Georgetown two weeks ago for her brother’s funeral. She was supposed to land at Pearson International Airport in Toronto yesterday. Ali, the report said, injured her neck and back sliding down the emergency chute, her daughter said. The injured passengers all had similar experiences and said they were scared for their lives and that it was an experience that they never want to have again. Some stated that they will be looking for compensation. 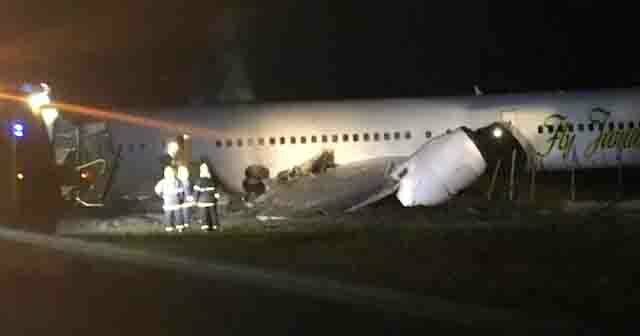 They thanked God and the pilots for preventing the plane from running off of the runway.